The tribunal has its seat in Hamburg-Nienstedten and started its work in 1996.
International Seabed Authority and ITLOS have connection to each other, both organizations have been established by UN Convention on the Law of the Sea. The International Tribunal for the Law of the Sea is an independent judicial body established by the United Nations Convention on the Law of the Sea to adjudicate disputes arising out of the interpretation and application of the Convention. The Tribunal is composed of 21 independent members, elected from among persons enjoying the highest reputation for fairness and integrity and of recognized competence in the field of the law of the sea. The Tribunal has jurisdiction over any dispute concerning the interpretation or application of the Convention, and over all matters specifically provided for in any other agreement which confers jurisdiction on the Tribunal. The Convention declares the Area and its resources to be "the common heritage of mankind", and the International Seabed Authority administers the resources of the Area. Among others within the photo galleries there are two images with reasonable depictions of the flag. The base colour is tribunal blue (a bit lighter than navy blue I was told). The charges are golden yellow. Within an ellipse there are scales above four rows of waves. The whole ensemble is flanked by the usual UN-suborganizations pair of wreaths. 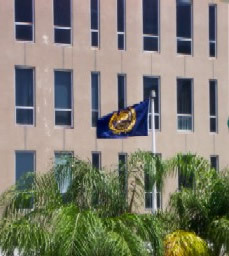 This flag sometimes is also flown outside the building. This flag is similar to the flag of International Seabed Authority. The only difference between ISBA flag and Tribunal flag is the inscription around the shield, the ITLOS flag has no any inscription.